The highlight of our trip. Saw it all! Wonderful! Did a night private tour. Plan on not resting much these 2 days in St. Petersburg. We packed so much into our 2 days. We booked a 2 day private tour and shared the cost with another couple. 2 Day Grand Tour. Very intensive but excellent tour. Highly recommended. Great and busy tour with ALLA. Great and busy tour with ALLA. Very professional. Good lunches. Great itineraries. Loved it. We had a excellent guide Eugene, he took us to every major site and he was so knowledgeable but also interesting. Two days to cover SPB is hard work, a lot of walking and a ton of information, but very well worth it. We splurged and spent the money for a tour for just the two of us. Fantastic two day deluxe tour with only six people in which we enjoyed the sights of the wonderful city of St Petersburg. We hired a two day tour. We hired a two day tour. It was amazing. I was truly surprised with the city and the history behind every single place. I highly recommend you seize the time you get in St. Petersburg. After much research I decided to book a private two day tour through Alla Tours. We took the 3-day deluxe tour with SPB. We booked a two day tour with Redsun Tours who was recommended to me. Irina was one of the best guide we had. Irina was one of the best guide we had. We had 3 day private tour at a fraction of the cost for ship excursion. 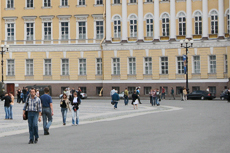 St. Petersburg is an amazing city, and we had a chance to see it very well. Alla Tours did a great job. Faultless!!! Comprehensive tour with our personal tour guide and driver. Our guide from Alla Tours, Polina, was exceptional. Our guide from Alla Tours, Polina, was exceptional. We had a marvelous two days exploring St. Petersburg, Peterhof, all of the main sights I wanted to see. The highlight of the trip. Small van with driver and guide, only six guests, most principle museums, churches and palaces. A 2 day tour, very tiring, we were in a group of 8. A 2 day tour, very tiring, we were in a group of 8. We visited the main sights, used the metro, really great tour. A fantastic tour over two days, very well organised, with all the main sites visited.A very well informed and friendly tour guide.